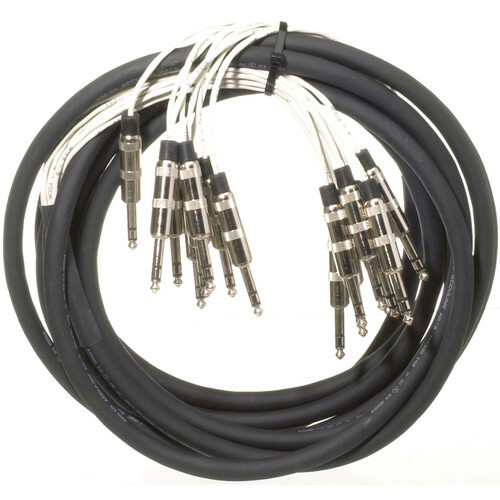 The Pro Co Sound MT8BQBQ-20 Analog Harness Cable 8x 1/4" TRS Phone Male to 8x 1/4" TRS Phone Male (20') is great for connecting all kinds of studio components. The cable is encased in an ArmorFlex outer jacket for durability with tangle-free flexibility, and is terminated with heavy-duty connectors for years of trouble-free use. Box Dimensions (LxWxH) 11.5 x 11.5 x 2.6"
MT8BQBQ-20 Analog Harness Cable 8x 1/4" TRS Phone Male to 8x 1/4" TRS Phone Male (20') is rated 5.0 out of 5 by 1. Rated 5 out of 5 by Dave S. from Workhorse I use these snakes extensively at work and in my own studio. I have found ProCo snakes to be rock solid workhorses! I was also surprised to find that they are very competitively priced to boot.